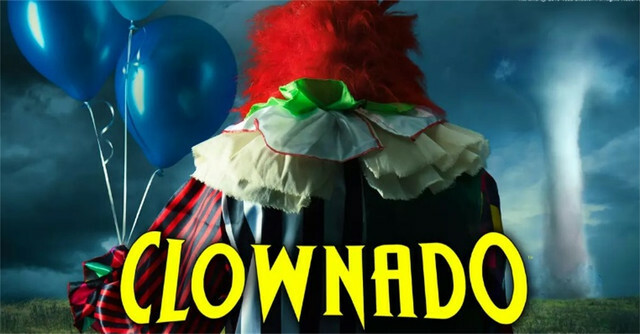 Official Trailer Arrives For CLOWNADO! Not too long ago, word hit the scene of a crazy film being developed titled CLOWNADO. When you first hear the name, it is easy to imagine a rip off of SHARKNADO but with clowns. However, the official trailer has arrived for director Todd Sheets' CLOWNADO, and can be viewed below. CLOWNADO stars Linnea Quigley, Eileen Dietz, Julie Anne Prescott, Dylinn Fawn Harvey, Millie Milan, and Joel D. Wynkoop. "A one of a kind thrill ride into the depths of depravity and gore!!! Be ready for one twisted and scary adventure! Believe it or not, it is a Horror Film Noir, with crazed killer Clowns on a rampage from Hell… out for revenge and only BLOOD can quench their savage desire for destruction!!!! Expect the Unexpected." Look for CLOWNADO to be arriving soon.